Meanwhile, there’s always that light at the end of this tunnel – literally – in the form of a bright blur that only becomes clear when your eyes finally can adjust to the contrast of the outdoors against the pitch black basalt surroundings. 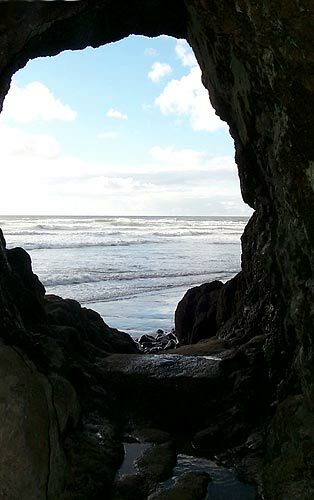 Then you come to the edge, where the sea appears again and this unique hidden cove becomes apparent. 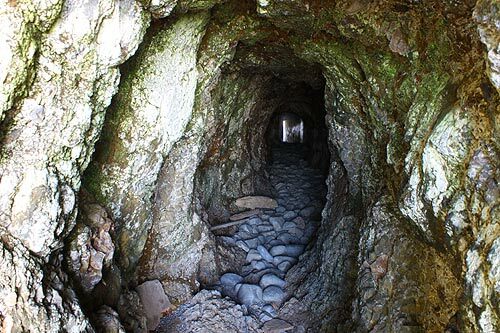 The tunnel was built in the early part of the 20th century by the Rosenberg family, which created the original resort in Oceanside. After drilling through to the other side, they built a massive walkway at the end of this cove, which allowed access to the another even more hidden beach called Lost Boy Beach. The walkway was called an “angel walk,” presumably because it was elevated about 20 feet off the ground to keep the waves away. That structure disappeared and that beach on the other side is indeed lost now, generally inaccessible. The tunnel through Maxwell Point was for many years covered by a landslide and completely inaccessible. Some time after the early 90’s, it was cleared, allowing people to wander through again. It’s not without its risks, however. A sign at the entrance warns of falling rocks during rainy or stormy days, and the tunnel has been shut off by at least a couple mud and rockslides since – leaving some stranded on the other side for a time.